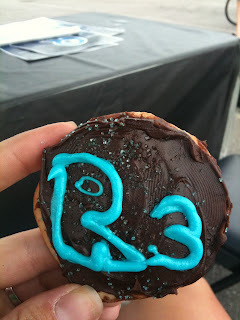 you gotta want it: REV3 Cedar Point! DISCO PARTY! Friday had been a long day, so I was looking forward to Saturday being a day to get my race plan/stuff together and relax! mmmmmm thank YOU awesome volunteer! On to getting my gear bags and bike ready... I was SO EXCITED to finally see my new KESTREL 4000 race-ready!! I took a test ride to see how she would hold up in the crosswinds... I initially had put a HED3 Tri-Spoke on the front. NOPE! The disc felt fine, but my ride was very "twitchy" with the Tri-Spoke. Putting the Mavec wheel back on solved the problem! I LOVE the bucket racks!! I also tested out the NEW Trakkers device - you can see how small it is here, but you can't see how lightweight it is! During the bike portion of the Aqua-bike, I kept it in a jersey pocket and forgot it was there! My bike was racked next to my teamie Megan Killian!! After dinner with some friends on the Evo-Tri team, we headed back to Hotel Breakers.... So Chris and I were walking down the hallway to go to our respective rooms, and we passed this "activity room", which had been empty Friday and Saturday. NOT NOW! There were lights flashing, disco music playing, and LINUS from Peanuts was doin' his thang out in the middle of dance floor... by himself! there were 2 hotel employees off to the side...texting/playing on their phones, not paying attention to him! Look what we saw after dinner!! We decided that we must join this party! Chris w told one of his roomies JP about the festivities (Kati was about zonked out - she had to get up EARLY to get the timing rolling for the race!!) and the fun BEGAN! I figured the employees could get paid for SOMETHING, so I asked them to take pictures with my camera! We were glad to see that a little family joined the party! See the Momma doing the "Charlie Brown"?? After about 20 minutes of Cha-Cha slide, Brickhouse and some other fabulous songs, we called it a night! Way to taper!! :) Hope this dance is on NEXT YEAR!! HA! LOVE IT. good to meet you! So funny!! Nothing like a little pre-race dance party to get you going! The dance party rocks, but a time machine!!!!??? That's the raddest! Wow that was actually just a really good trip all around! Fun stuff! Bummed that we missed the dance party!!! Nothin like throwin down with Linus!